Michael G. Fitzsimons, head of the drug-testing program at the Massachusetts General Hospital’s Department of Anesthesia and Critical Care, discusses preventing fallout from addicted physicians. Anesthesiologists routinely administer potent cocktails of narcotics to sedate patients during surgery. Between 1% and 2% of those physicians wind up addicted to the very drugs they use to help others. Though the numbers aren’t high, the price paid by addicts (and the health care system) is, says Michael G. Fitzsimons, an anesthesiologist and head of the substance abuse program at the Massachusetts General Hospital’s Department of Anesthesia and Critical Care—one of the few such departments with mandatory drug testing. Fitzsimons, a former flight surgeon with the U.S. military (where testing is widespread), says such programs could help stem addiction where other efforts have failed. Q: How does the addiction rate among anesthesiologists compare with that of other doctors and the general population? A: It seems to be about the same as it is for the population at large. Regarding other medical specialties, the incidence appears to be slightly lower. The crucial difference between anesthesiologists and other specialists isn’t the addiction rate but the potency of the drugs anesthesiologists use. 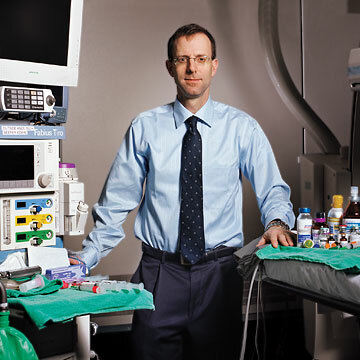 Between 10% and 20% of addicted anesthesiologists die from overdose. That’s very high. Q: What happens to those who survive? A: Nearly 75% of physicians who enter treatment programs ultimately return to practice. But the process, including detox, inpatient and residential treatment, outpatient treatment, psychiatric treatment and mandatory follow-up drug testing is lengthy and expensive. Returning a single physician to practice costs about $100,000, and that doesn’t include the costs to the hospital for lost revenue and disruption to the staff. By contrast, our entire drug-testing program costs just $70,000 per year to run. Q: When is the risk of abuse greatest? A: Within the first five years after medical school, a period that includes residency, when physicians are under a lot of stress. For the first time they’re actually handling these drugs and seeing the calming effects they have on patients. They become curious. Q: How do physicians rationalize drug use? A: They’ve worked with these drugs, so they may feel they have some control. They understand the potency, but they don’t necessarily understand how strongly the drugs will affect them. They don’t have someone standing by, the way a patient under anesthesia does. Q: Can closer monitoring cut down on abuse? A: Control of how drugs are checked out, used and returned is important. So is education. But experience shows that these efforts alone don’t decrease abuse. Addicts can find ways around even the best controls. These are very smart people. Q: At the MGH, who is tested, and how frequently? A: When we began in 2003, we made testing voluntary, to ease into the program and get it running smoothly. Since July 2005, each of our 100 residents has been subject to at least two random tests during their first year, with a random 20% subject to a third test. In their second and third years, they have at least one test, with 30% undergoing a second. Our 140 staff anesthesiologists and nurse anesthetists also have mandatory tests: a pre-placement test and a random test within six months of their biannual reappointment. The random element is crucial. Q: What difference has the program made? A: Prior to testing, we had a drug abuse incidence of 2.2% among first-year residents, the most vulnerable group. The incidence has decreased, but because the number of physicians involved is small, it’s too early to confirm that it’s statistically significant. In another five years we should know. Q: Why has the medical community been slow to embrace drug testing for physicians? A: The reasons range from privacy concerns and the need for more conclusive studies showing its effectiveness to the argument that testing casts suspicion even upon doctors showing no signs of drug use. Right now, the MGH and the Cleveland Clinic are the only nonmilitary anesthesia departments with random drug testing. Q: What sort of danger does this problem represent for patients? A: Anesthesia remains very safe. Even among physicians who become addicted, work is often the last thing that suffers, while other areas of their lives are falling apart. They are often very high-level performers. They may be the chief resident in their class, involved in national committees. Q: The last people you’d suspect, in other words? A: Yes. But we’re becoming better at recognizing warning signs. It used to be that if someone started coming in late and snapping at colleagues, or if the person’s clinical performance wasn’t what we would expect, we would attribute it to stress. Now the first thing we think is, could it be substance abuse? In an environment where doctors are paid by the test, Nortin M. Hadler is convinced that many tests are useless, or worse, harmful.